We truly live in a golden age of horsepower. 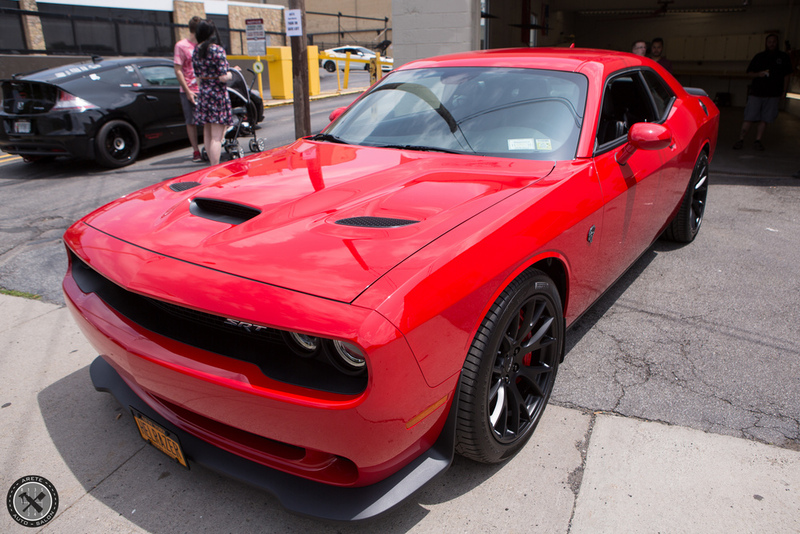 Vehicles like the Dodge Challenger Hellcat, with its mind-bending 707hp, represent the new school of American muscle. The amount of from-factory power cars like this are delivering has never before been seen at such an attainable price point. Even average commuter vehicles are coming with significant power that would be unheard of just 10 years ago. Among the cars really pushing the limits, the Hellcat is special. Its incredibly high output has caused ripples among American OEMs who are now all cooking up their answers to this certifiably insane Mopar machine. It will certainly be remembered favorably by history. The Hellcat is a byproduct of modern times and one of the most exciting American offerings out there at the moment. That's why we were so thrilled to have one come in for a seriously intensive new car detail. This example traveled from Buffalo and arrived with less than 1,000 miles on the odometer for CQuartz Finest, paint correction, paint protection film, and wheel and caliper coating. It arrived on a sunny day for a 5 day stay! The Torred paint finish gleamed in the sun but it was only going to get better once we were underway. During initial inspection upon arrival. After inpsection we dove right in and began our extensive pre-coating decontamination service. The car traveled from Buffalo to see us so there were quite a few areas of bio contamination. Iron-X also effectively loosens bio contamination such as bug strikes. Iron-X was applied prior to our initial wash in order to remove embedded rail dust and loosen other contamination. Iron-X was left to dwell on the vehicle for several minutes prior to our initial hand wash.
Dave assuring no surface is left untouched during our initial wash post iron removal. DJ rinsing his wash media. We are meticulous about process and methodology. The two bucket method is just one of the pillars of our process. Washing the complex front end of the Hellcat. During our post wash rinse the amount of iron contamination was apparent! Rinsing the vehicle post wash.
After our initial wash it was time for a nano clay treatment. Our detailers in action performing a nano-clay treatment to remove physical contamination from the paint surface prior to paint correction. After our decontamination we dried all jambs. Drying the vehicle with fine microfiber towels post decontamination. Areas that weren't reachable by hand were dried using compressed air. As previously mentioned, there was still protection holding on so we wiped down the vehicle with isopropyl alcohol prior to paint correction to assure we were working with bare paint. A very plush high nap microfiber towel was used in order to avoid marring. After our thorough decontamination it was time to prep for paint correction. Proper prep ensures the best possible results while protecting sensitive unpainted trim. We removed the grilles in the hood in order to protect them while ensuringng we had access to every inch of the paint surface. Trim that was unable to come off the the vehicle is carefully taped off. After the vehicle was fully prepped for paint correction it was time to remove the wheels to prep them for coating with CQuartz Finest. We had to take special care due to their matte finish. The calipers were also treated to CQuartz Finest and were properly cleaned/prepped beforehand. The barrels of the wheels being coated in CQuartz Finest post prep. Action shot of the calipers being coated in CQuartz Finest. The faces of the wheel were also coated in CQuartz Finest. After the wheels were coated they were remounted and bagged. Finally the car is ready for its paint correction & paint protection film prep! 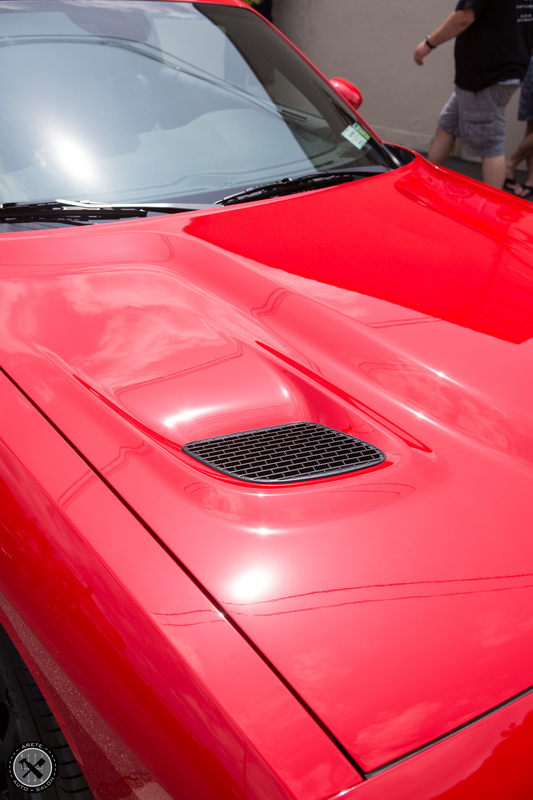 Notice that we bagged the hood vents as well in order to prevent dust from our correction penetrating cracks and crevices. We are dedicated to assuring the best possible results. Throughout detail services like this we are always taking extra steps to work toward that goal. Onto the correction shots! There were many areas of more severe defecting, including sanding marks from factory, to care for. After a test section it was determined that a two step correction would be necessary to deliver optimal results. The paint surface was sensitive therefore it was not possible to correct and finish in a single step without leaving marring behind. There was a variety of defects in the paint surface. The shots below show the results of our two step correction that elevated this Hellcat to Finest standards. Note: Paint correction afters have a small amount of dust in them. 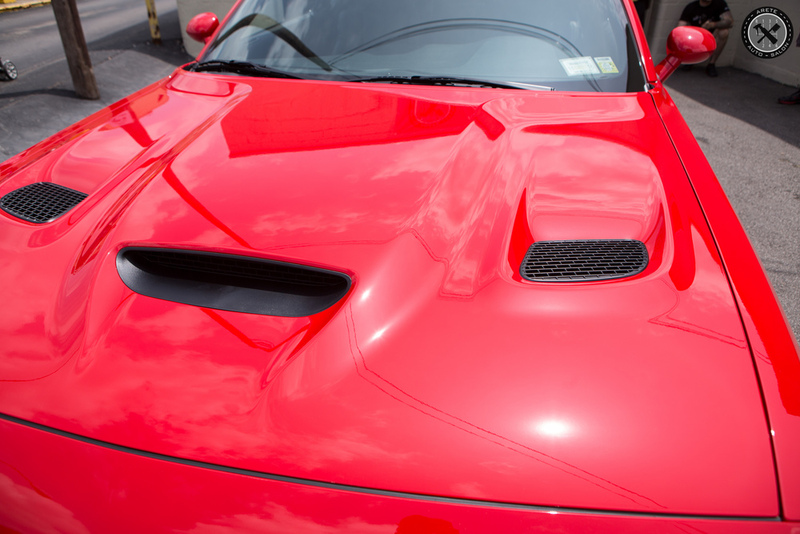 The front bumper, door sills, and door cups of this Challenger Hellcat were protected with paint protection film. Prior to application by Hi-Line Tint we were sure to correct the areas being covered. Our experienced team working together to accomplish optimal results. Maintaining our pads during correction is critical to assure the best possible results. We always make sure to use the best tool for the job. In this case it's a 2" machine to correct every nook and cranny. After correction paint protection film was installed. After our two step correction it was time to prep the paint surface and apply three coats of CQuartz Finest. We apply two as a standard but this customer elected for an additional layer to even further enhance gloss. After coating we cured the coating with IR lamps to deliver maximum chemical resistance for the long journey home. The coating is spread across each panel then leveled. Dave in action applying Finest! After coating the vehicle was IR cured for maximum chemical resistance. After coating we displayed this lovely Challenger Hellcat at our open house. We had a blast and the turnout was fantastic. Thank you so much to all those who attended! This vehicle was our centerpiece and we could not be more proud of the results! CQuartz Finest delivers an impressive, visually stunning product and we cannot say enough about the latest version to hit the market. It was truly an honor to work with this Hellcat and we know the owner is a highly preservation minded individual who will preserve and care for this example for many, many years to come. We are so pleased to be a part of the initial work to perfect this car and are humbled to be chosen for the task. If you plan to own and care for a special vehicle like this one don't hesitate to call us! Enjoy the finished results. As usual, all images will expand when clicked! Thanks for reading. Posted on June 28, 2015 by Eric Potter and filed under write ups and tagged CQuartzFinest.